For other uses, see Lime (disambiguation). A lime (from French lime, from Arabic līma, from Persian līmū, "lemon") is a citrus fruit, which is typically round, green in color, 3–6 centimetres (1.2–2.4 in) in diameter, and contains acidic juice vesicles. There are several species of citrus trees whose fruits are called limes, including the Key lime (Citrus aurantifolia), Persian lime, kaffir lime, and desert lime. Limes are a rich source of vitamin C, sour and are often used to accent the flavours of foods and beverages. They are grown year-round. Plants with fruit called "limes" have diverse genetic origins; limes do not form a monophyletic group. 1 Plants known as "lime"
The difficulty in identifying exactly which species of fruit are called lime in different parts of the English-speaking world (and the same problem applies to homonyms in other European languages) is increased by the botanical complexity of the citrus genus itself, to which the majority of limes belong. Species of this genus hybridise readily, and it is only recently that genetic studies have started to throw light on the structure of the genus. The majority of cultivated species are in reality hybrids, produced from the citron (Citrus medica), the mandarin orange (Citrus reticulata), the pomelo (Citrus maxima) and in particular with many lime varieties, the micrantha (Citrus micrantha). Kaffir lime (Citrus hystrix); a papeda relative, is one of three most widely produced limes globally. Key lime (Citrus × aurantifolia=Citrus micrantha × Citrus medica) is also one of three most widely produced limes globally. Persian lime (Citrus × latifolia) a key lime × lemon hybrid, is the single most widely produced lime globally, with Mexico being the largest producer. Note that the tree species known in Britain as lime trees (Tilia sp. ), called linden in other dialects of English, are broadleaf temperate plants unrelated to the citrus fruits. Although the precise origin is uncertain, wild limes are believed to have first grown in Indonesia or Southeast Asia, and then were transported to the Mediterranean region and north Africa around 1000 CE. To prevent scurvy during the 19th century, British sailors were issued a daily allowance of citrus, such as lemon, and later switched to lime. The use of citrus was initially a closely guarded military secret, as scurvy was a common scourge of various national navies, and the ability to remain at sea for lengthy periods without contracting the disorder was a huge benefit for the military. The British sailor thus acquired the nickname, "Limey" because of their usage of limes. In 2016, global production of lemons and limes was 17.3 million tonnes, led by India with 17% of the world total (table). Mexico and China were other major producers. Limes have higher contents of sugars and acids than lemons do. Lime juice may be squeezed from fresh limes, or purchased in bottles in both unsweetened and sweetened varieties. Lime juice is used to make limeade, and as an ingredient (typically as sour mix) in many cocktails. In cooking, lime is valued both for the acidity of its juice and the floral aroma of its zest. It is a common ingredient in authentic Mexican, Vietnamese and Thai dishes. Lime soup is a traditional dish from the Mexican state of Yucatan. It is also used for its pickling properties in ceviche. Some guacamole recipes call for lime juice. The use of dried limes (called black lime or loomi) as a flavouring is typical of Persian cuisine and Iraqi cuisine, as well as in Persian Gulf-style baharat (a spice mixture that is also called kabsa or kebsa). Lime is an ingredient of many cuisines from India, and many varieties of pickles are made, e.g. sweetened lime pickle, salted pickle, and lime chutney. Key lime gives the character flavoring to the American dessert known as Key lime pie. In Australia, desert lime is used for making marmalade. Lime is an ingredient in several highball cocktails, often based on gin, such as gin and tonic, the gimlet and the Rickey. Freshly squeezed lime juice is also considered a key ingredient in margaritas, although sometimes lemon juice is substituted. 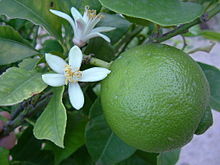 Lime extracts and lime essential oils are frequently used in perfumes, cleaning products, and aromatherapy. Raw limes are 88% water, 10% carbohydrates and less than 1% each of fat and protein (table). Only vitamin C content at 35% of the Daily Value (DV) per 100 g serving is significant for nutrition, with other nutrients present in low DV amounts (table). Lime juice contains slightly less citric acid than lemon juice (about 47 g/l), nearly twice the citric acid of grapefruit juice, and about five times the amount of citric acid found in orange juice. Lime pulp and peel contain diverse phytochemicals, including polyphenols and terpenes, many of which are under basic research for their potential properties in humans. Contact with lime peel or lime juice followed by exposure to ultraviolet light may lead to phytophotodermatitis, which is sometimes called margarita photodermatitis or lime disease (not to be confused with Lyme disease). Bartenders handling limes and other citrus fruits while preparing cocktails may develop phytophotodermatitis. A class of organic chemical compounds called furanocoumarins are reported to cause phytophotodermatitis in humans. 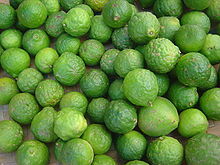 Limes contain numerous furanocoumarin compounds, including limettin (also called citropten), bergapten, isopimpinellin, xanthotoxin (also called methoxsalen), and psoralen. Bergapten appears to be the primary furanocoumarin compound responsible for lime-induced phytophotodermatitis. Lime peel contains higher concentrations of furanocoumarins than lime pulp (by one or two orders of magnitude), and so lime peels are considerably more phototoxic than lime pulp. Persian limes appear to be more phototoxic than Key limes. ^ Company, Houghton Mifflin Harcourt Publishing. "The American Heritage Dictionary entry: lime". www.ahdictionary.com. Archived from the original on 11 April 2016. ^ a b c "Lime". Encyclopædia Britannica, Inc. 2016. Archived from the original on 10 August 2016. Retrieved 16 July 2016. ^ Rotter, Ben. "Fruit Data: Yield, Sugar, Acidity, Tannin". Improved Winemaking. Archived from the original on 8 June 2014. Retrieved 3 September 2014. ^ a b c Plattner, Kristy (26 September 2014). "Fresh-Market Limes" (PDF). USDA Economic Research Service. Archived from the original (PDF) on 12 April 2015. ^ Curk, Franck; Ancillo, Gema; Garcia-Lor, Andres; Luro, François; Perrier, Xavier; Jacquemoud-Collet, Jean-Pierre; Navarro, Luis; Ollitrault, Patrick (2014). "Next generation haplotyping to decipher nuclear genomic interspecific admixture in Citrus species: analysis of chromosome 2". BMC Genetics. 15: 152. doi:10.1186/s12863-014-0152-1. PMC 4302129. PMID 25544367. ^ Li, Xiaomeng; Xie, Rangjin; Lu, Zhenhua; Zhou, Zhiqin (July 2010). "The Origin of Cultivated Citrus as Inferred from Internal Transcribed Spacer and Chloroplast DNA Sequence and Amplified Fragment Length Polymorphism Fingerprints". Journal of the American Society for Horticultural Science. 135 (4): 341–350. doi:10.21273/JASHS.135.4.341. Archived from the original on 24 April 2015. Retrieved 24 April 2015. ^ Wall, Tim (18 January 2011). "Citrus Fruit Gets Paternity Test". Discovery.com. Discovery. Archived from the original on 30 January 2013. Retrieved 24 April 2015. ^ "Australian Blood Lime". homecitrusgrowers.co.uk. Archived from the original on 31 August 2012. ^ "World Regions/Production Quantity for lemons and limes, 2016; from pick lists". Food and Agriculture Organization of the United Nations, Statistics Division (FAOSTAT). 2017. Retrieved 11 March 2018. ^ Lewis, HE (3 February 1971). "State of knowledge about scurvy". Proc. R. Soc. Med. 65 (1): 39–42. PMC 1644345. PMID 4552518. ^ "Limey". Oxford Dictionaries. Oxford University Press. Archived from the original on 6 June 2012. Retrieved 23 April 2013. ^ Penniston KL, Nakada SY, Holmes RP, Assimos DG (2008). "Quantitative Assessment of Citric Acid in Lemon Juice, Lime Juice, and Commercially-Available Fruit Juice Products". Journal of Endourology. 22 (3): 567–70. doi:10.1089/end.2007.0304. PMC 2637791. PMID 18290732. ^ Gross, T. P.; Ratner, L.; de Rodriguez, O.; Farrel, K. P.; Israel, E. (1987). "An outbreak of phototoxic dermatitis due to limes". Am J Epidemiol. 125 (3): 509–514. doi:10.1093/oxfordjournals.aje.a114557. PMID 3812457. ^ Kung, A. C.; Stephens, M. B.; Darling, T (2009). "Phytophotodermatitis: Bulla formation and hyperpigmentation during spring break" (PDF). Mil. Med. 174 (6): 657–661. doi:10.7205/MILMED-D-01-7208. PMID 19585784. ^ Hankinson, Andrew; Lloyd, Benjamin; Alweis, Richard (2014). "Lime-induced phytophotodermatitis". J Community Hosp Intern Med Perspect. 4 (4): 25090. doi:10.3402/jchimp.v4.25090. PMC 4185147. PMID 25317269. ^ Riahi, Ryan R.; Cohen, Philip R.; Robinson, Floyd W.; Gray, James M. (June 2009). "What Caused The Rash On This Man's Wrist And Hand?". The Dermatologist. 11 (6). ^ Abramowitz, Alan I.; Resnik, Kenneth S.; Cohen, Kenneth R. (1993). "Margarita Photodermatitis". New England Journal of Medicine. 328 (12): 891. doi:10.1056/NEJM199303253281220. PMID 8441448. ^ Weber, Ian C; Davis, Charles P; Greeson, David M (1999). "Phytophotodermatitis: The other 'lime' disease". The Journal of Emergency Medicine. 17 (2): 235–237. doi:10.1016/s0736-4679(98)00159-0. ISSN 0736-4679. PMID 10195477. ^ L. Kanerva (2000). Handbook of Occupational Dermatology. Springer. p. 318. ISBN 978-3-540-64046-2. Archived from the original on 21 May 2016. ^ McGovern, Thomas W.; Barkley, Theodore M. (2000). "Botanical Dermatology". The Electronic Textbook of Dermatology. Internet Dermatology Society. Section Phytophotodermatitis. Retrieved November 29, 2018. ^ a b c d Nigg, H. N.; Nordby, H. E.; Beier, R. C.; Dillman, A.; Macias, C.; Hansen, R. C. (1993). "Phototoxic coumarins in limes" (PDF). Food Chem Toxicol. 31 (5): 331–35. doi:10.1016/0278-6915(93)90187-4. PMID 8505017. ^ a b c Wagner, A. M.; Wu, J. J.; Hansen, R. C.; Nigg, H. N.; Beiere, R. C. (2002). "Bullous phytophotodermatitis associated with high natural concentrations of furanocoumarins in limes". Am J Contact Dermat. 13 (1): 10–14. doi:10.1053/ajcd.2002.29948. ISSN 0891-5849. PMID 11887098. This page was last edited on 28 March 2019, at 18:17 (UTC).